On October 20th, I tweeted on @theknowitallmom, “Today’s Goal: Drink more water. Simple, measurable, achievable.” And I did it. Earth-shattering? No. But still, it needed to be done. On October 19th, I posted on my Facebook page my pending return to yoga, believing that if I put it out into the Universe I would be moved to do it, and on October 20th, I did it. Again, nothing too lofty, but it made a difference to me. So in the interest of continuing this achievement-oriented, just-move-forward pattern of behaviour, I’ve decided to chronicle my daily triumphs and tribulations in a series of posts called Goals and Gratitude. My plan is to catalogue the tasks that I want to accomplish, ranging from the mundane (as above) to the sublime (at least to me, just wait and see!). 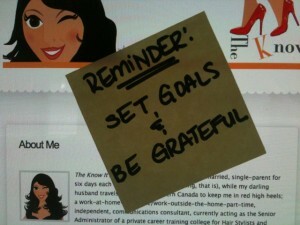 Akin to this, I want to take some time to recognize those things already in my life for which I am most grateful. My commitment to you, Readers, and to myself, is to update it EVERYDAY for 30 days. At the end, I will write a summary of what I have accomplished and what it all means. Goal: Move my body, sweat a little, eat more protein. Hey wait: That’s two goals. Ambitious plans for the first day! Gratitude: I am grateful for the sleepy-eyed, good morning hug from my Little Miss, still warm from her bed, and for the fact that at 14 she’s still happy to see me in the morning. And since I have stated two goals, another expression of gratitude is due: I am grateful for my Darling Husband, who left home at 5:00 AM on this Sunday morning for a conference in New Orleans, and who now, as I write this, just called to say that he is waiting stand-by in LAX, delayed by five hours and re-routed through Chicago, all because his first flight out of Vancouver was late and he missed his connection. He works so hard and sacrifices so much, all for this nice life that we live, and we miss him. Tune in tomorrow for Day 2 of Goals and Gratitude, to see if, in the words of Britney Spears, “I did it” again, and for my next aspiration and expression of thanks.